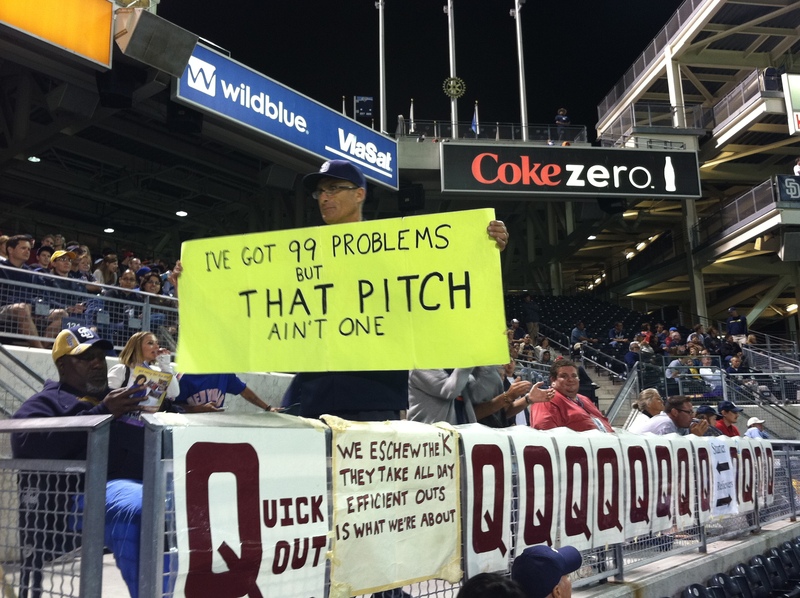 If you havin’ girl problems, I feel bad for you son…I got 99 problems, but that pitch ain’t one. Saw this at the Padres game last night. Clever. Padres hit a home run, he held up the sign. I chuckled. Another thing about this picture, (click on it to enlarge) it captures the “Q” signs that this usher hangs over the railing that stand for “Quick Out”. My guess is that 99% of average baseball fans have no clue what that Q stands for and once they see it stands for Quick Out, they have no clue what that means. It’s just when the pitcher gets the batter out in 3 pitches or less. (I think? Correct me if I’m wrong). Anyway, the sign reads “WE ESCHEW THE ‘K’ THEY TAKE ALL DAY EFFICIENT OUTS IS WHAT WE’RE ABOUT” Punctuation aside, it’s a decent little saying, but again, 99% of people don’t even know what “eschew” means. It means ‘to avoid, keep away from‘. Whatever. When I read that, it makes me think that ‘they’ think they’re better than me. I don’t even know who ‘they’ are. But ‘they’ are somebody, I know that. The “Q” signs are certainly an original idea, at least I’d never seen it before…so that I like. But honestly, although their meaning represents good baseball… I think they are dumb. Who cares what I think though, this guy has fun doing it… more power to him. For the record, I’m not talking down to anybody about a) their baseball knowledge, or b) their vocabulary. Years ago, when I first saw those Q signs, I had no clue what they meant, and if it wasn’t for context, I wouldn’t have known the definition of ‘eschew’ either. Ok, done with that. Back to 99 Problems sign. I know it’s not a new twist put to the 99 Problems lyrics, I’m sure folks have been holding up signs like this at ballgames since the mid-90’s. Just the first time I’ve seen it. Cue readers: The mid-90s, bp?! You idiot, that’s Jay-Z! Came out in 2004, then got crazy popular in 2009! Pfft…mid-90s. Clown. Sure, he made it popular… popular enough to be #2 on Rolling Stone’s 2009 list of the 50 Best Songs of the Decade. I get that. But let’s give credit where credit is due. Ice-T, 1993’s Home Invasion album. Know THAT, suckas. 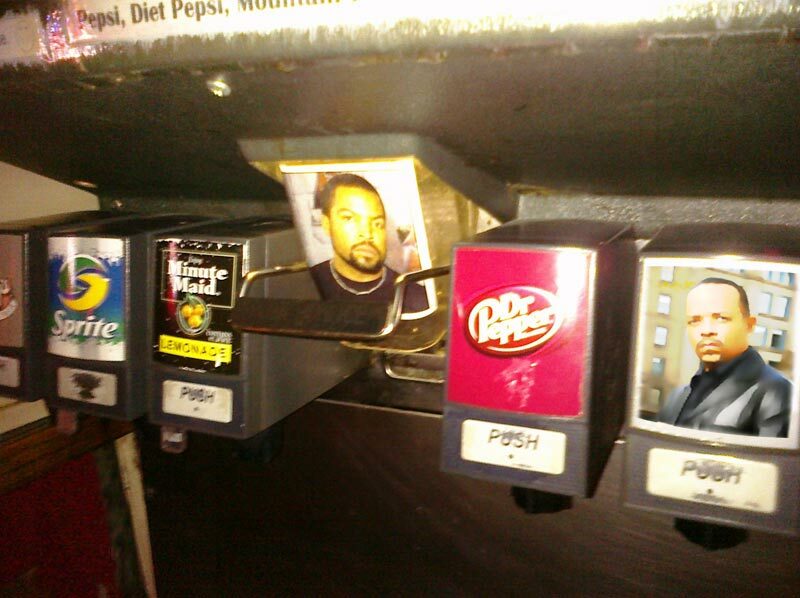 Jay-Z was sampling Ice-T. Don’t believe me? Go read up on wiki. Oh, and for the record, I am talking down to you about your 90s rap knowledge. But who are we kidding… the real reason I’m posting this little “99 Problems” rant? Just one more reason to post the greatest soda fountain dispenser in the history of modern day restaurants…and I’m spent. This entry was posted in Baseball, MLB, Music and tagged 99 problems, Baseball, Ice Cube, Ice-T, Jay-Z, Major League Baseball, MLB, Padres, Q signs, quick out, San Diego, San Diego Padres. Bookmark the permalink.